A sweepingly thorough account of the ways in which modern science and religion share common ground.Few cultural cleavages are as stark as the one between modern science and religion—or at least, that’s the conventional wisdom. Debut author Martin, who served as the governor of North Carolina from 1985 to 1993 and holds a doctorate in chemistry from Princeton University, argues that the relationship between the two systems, though historically fraught with tension, has evolved over time toward a point of reconciliation, if not harmony. Prior to Galileo’s monumentally important astronomical discoveries, he says, theology and science enjoyed a fairly cozy relationship, with each supporting the other, and afterward, they affected a détente that lasted centuries until Charles Darwin’s seminal discoveries renewed the acrimony between them. However, Martin contends that the most recent scientific discoveries close the gap and function as instruments of revelation. As a result, he says, many people see Darwinian evolution as the final confirmation of atheism but “Others of us prefer to interpret the same scientific evidence as modern revelation of the creative glory of God, revealed to us through the unique intellectual powers that He has provided for us to acquire.” The author treats readers to a stunningly comprehensive tour of modern science that visits the innovations of physics, biology, and chemistry. He finds in all of them evidence for an updated version of the classical teleological argument, which states that the order of the universe is so intricately complex that it powerfully suggests intentional design. The author reassesses various sources of conflict between science and religion, providing fresh perspectives on such things as the infamous Scopes “monkey trial” of 1925 and the controversy over the teaching of creationism in schools. But although he ably discusses the rift between the political left and right on matters of science, he sometimes tries to cover too much territory; for example, his quick, even dismissive discussion of health care abandons the rigor and meticulousness that typifies the study as a whole. Overall, though, this is a provocative introduction for the “educated nonscientist”—one written out of great respect for both science and religion. A philosophically challenging but accessible argument for comity between reason and faith. Revelation through Science works to bridge the polemical divide between religious accounts of creation and the hard sciences. In Revelation through Science, James G. Martin offers a balanced approach to the traditional dichotomy of science versus religion, providing alternative ways of understanding how the physical world contains evidence of the existence of God. The book follows a logical progression through the history of science, and chapters track such revelation through astronomy, physics, biology, geology, and paleontology, interspersed with biographical and historical accounts of Galileo, Tycho Brahe, Darwin, and the Scopes trial. Martin’s information, though, doesn’t often go beyond that available in standard encyclopedia entries. In an early chapter, science around the movement of galaxies is used to indicate common origin and is tied into creation accounts in Genesis. This equation of the scientific with the religious sounds plausible, even possible, but the book simply points similarities out without providing compelling evidence to prove connections. In the end, the work’s assertions remain in the faith-based realm rather than building upon empirical and demonstrable proofs. Scientists and scientific debates are presented in a similar way, with the book reconciling Darwinian evolution with God as the prime mover or Deistic watchmaker. Such explanations exist in dialogue with eighteenth-century intellectual history and provide a fertile and thought-provoking opportunity around which to structure further arguments. The book targets nonscientists interested in these debates, and Martin’s sincere and frank tone shows he has thought much about his topics. He concedes his biases toward religion throughout the book, but his straightforward candor makes it appealing to hear him out. The strength of the work lies in its trenchant and clear prose. The information is easy to follow. The book will appeal to open-minded audiences interested in learning how to reconcile religion and science, though it is unlikely to sway nonbelievers looking for more rigorous analysis or scholarly examinations of how divine influence might permeate the wonders of the physical world. Revelation through Science offers a novel approach to a timeworn debate and is notable for its attempt to bridge the polemical divide between religious accounts of creation and the evidence that the hard sciences have adduced. 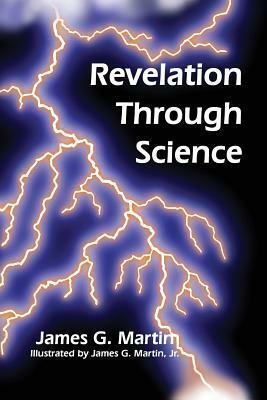 In Revelation through Science, James G. Martin sets out to prove that belief in a divine Creator and acceptance of the discoveries of science are not mutually exclusive, that “continuing revelation might be found in the scientific journals and instruments of discovery. Martin’s passionate exploration covers a number of sciences—biology, geology, organic chemistry and genomics to name a few—and showcases his sense of wonder and awe. He hopes to show that the number of coincidences necessary to create intelligent human beings—from the complexity of the eye to the existence of complex proteins—is so enormous, it could only have come about through the agency of a divine Creator. But covering so many disciplines means leaving much more out. Martin must often make large leaps, and frequently pleads with readers to be patient with the difficult material, to skip ahead if a section’s too hard. Written for the layperson (or “educated non-scientist,” as Martin’s back cover notes), the book shouldn’t need such caveats. At one point, Martin tells the delightful story of Wilson and Penzias’ accidental discovery of the echo of the Big Bang. To prove their discovery was “indeed the cosmic signal from the dawn of creation,” writes Martin, they “were able to demonstrate (a) that a graph of the variation of intensity at different observed frequencies was a precise match for what Max Planck had found for radiation as a function of temperature….” No number of humorous illustrations or personal stories can carry novices past dense sections such as this. The book includes a glossary (incomplete); index of names and subjects; bibliography of sources cited; list of Nobel Prize winners cited; and list of Implied Anthropic Coincidences and Conditions. “Revelation through science does not dishonor our Creator, but adds to our understanding of His majesty and love for us,” Martin writes. Unfortunately, his difficulty in simplifying scientific concepts clearly for a general audience means his heartfelt message will likely fail to engage and persuade his readers.